RHINO-STOP® is the latest innovation by Safe Direction Pty Ltd in modular barrier designs providing superior design, rapid installation and driver confidence. 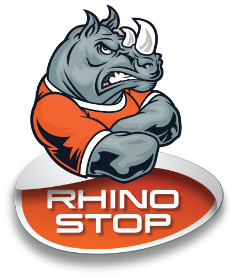 RHINO-STOP® has been crash tested to comply with and exceed the 30kN impact requirement of AS/NZS 1170.1. RHINO-STOP® may be installed as a standalone post and w-beam rail configuration or with balustrade and mesh infill attachments when fall protection for pedestrians is required. The modular design of RHINOSTOP® and its available attachments allows the system to be configured to suit site requirements using standard components. RHINO-STOP Sky-Edge conserves valuable space by positioning on the outer edge of the substrate. This allows vehicles to utilise the full width of the trafficable area. RHINO-STOP Sky-Edge absorbs impact energy and requires just one (1) holding down bolt per post.